What drives people to risk their lives for adventure? Is adrenaline such a powerful drug that it drives some to risk everything—to endure killer pain—to ignore insurmountable risk? Meru is the story of just such a quest. What drives people to risk their lives for adventure? Is adrenaline such a powerful drug that it drives some to risk everything—to endure killer pain—to ignore insurmountable risk? 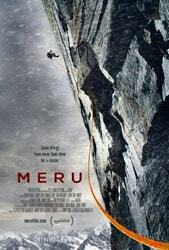 Meru is the story of just such a quest. Three elite mountain climbers risk everything as they attempt to climb the unclimbable Sharks Fin atop Mount Meru, a shear granite slab rising to the heavens from a mountain of ice. We travel with them, beginning our introduction to these brave souls while thrilling to scenery that exists above a bubbling cauldron of clouds down below. Alas, but a hundred and twenty meters from a peak we can clearly see a decision must be made: descend or die. The climbing sequences are extraordinary…a view into nature’s manic heart that most of us will never encounter. But just as fascinating are the stories of the lives of these climbers. Why are they driven to a quest beyond human capability? What is this monster that roils against fear, against their responsibilities to those they love, drawing them back to the furious heavens? Devastated by their failed attempt, both physically and mentally, the mountain calls. Fate resists with determined eloquence, but the siren call of Mount Meru wails strong.